Make yourself at home in one of the 3 guestrooms featuring DVD players and flat-screen televisions. Prepare your meals in the shared/communal kitchen. Complimentary wireless Internet access keeps you connected, and digital programming is available for your entertainment. Private bathrooms with showers feature complimentary toiletries and hair dryers. Stay in one of 44 guestrooms featuring flat-screen televisions. Complimentary wireless Internet access keeps you connected, and digital programming is available for your entertainment. Private bathrooms with bathtubs or showers feature spring water baths and designer toiletries. Conveniences include laptop-compatible safes and desks, and housekeeping is provided daily. A riverfront Newcastle hotel near the intu Metrocentre, with included breakfast and a barHoliday Inn Express® Newcastle - Metro Centre hotel is just off the A1 and offers free on-site parking.The shops, restaurants and IMAX cinema at the huge intu Metrocentre are just over a mile away. There are bus stops right outside the hotel and quick train links to central Newcastle from nearby Metrocentre station. Guests staying on business will have easy access to Newcastle Business Park, and the hotel offers 2 naturally lit meeting rooms for up to 30 people. A 20-minute drive from the hotel, the open-air Beamish Museum recreates daily life in the early 1900s through period buildings and costumed staff. The Angel of the North, a breathtaking modern sculpture, is around 15 minutes by car from the hotel, as are the city's medieval castle, the lively Quayside entertainment area and the iconic Tyne Bridge.At this hotel you can enjoy:- Free WiFi- Complimentary parking- All Day DiningSet yourself up for the day with the included Express Start™ Breakfast buffet, featuring a choice of hot and continental items. The light-filled lounge bar is the place to get a refreshing drink after work or plan a tour of the city over coffee. Up-to-the-minute Next Generation rooms have blackout curtains and pillow menus for total comfort. With a stay at Bentley's in Newcastle-upon-Tyne, you'll be a 4-minute drive from O2 Academy Newcastle and 6 minutes from St. James' Park. This guesthouse is 2.2 mi (3.5 km) from Quayside and 1.6 mi (2.6 km) from Metro Radio Arena. With a stay at Sure Hotel by Best Western Newcastle in Newcastle-upon-Tyne, you'll be within a 15-minute walk of St. James' Park and O2 Academy Newcastle. 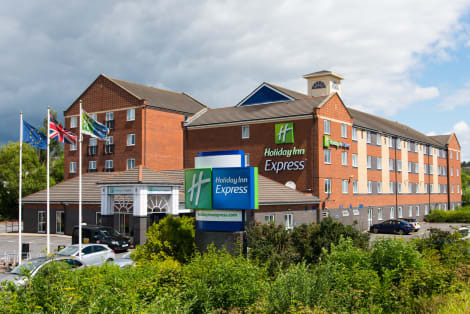 This hotel is 1.7 mi (2.7 km) from Quayside and 1.2 mi (2 km) from University of Newcastle-upon-Tyne. 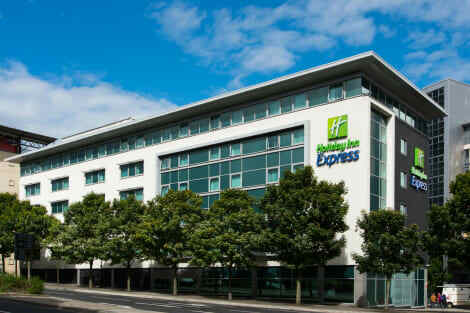 A city-centre hotel close to Newcastle Station, with breakfast includedHoliday Inn Express® Newcastle City Centre hotel is 10 minutes by car from the A1(M)We’re right at the heart of the city centre, within walking distance or a quick Metro ride of most attractions, and you can park for free from 5pm-8am in the car park next door. Newcastle International Airport (NCL) is only a 15-minute drive away. A short stroll gets you to the huge intu Eldon Square shopping centre or a concert at the O2 Academy, and you can brush up on local history and science at the free Discovery Museum, right across the road. In the evening you can check out the legendary bars and clubs of the Bigg Market or the Diamond Strip. Here on business? Host a seminar for up to 30 people in our 2 naturally lit conference rooms, or take a short drive to meetings at Newcastle Business Park, home to many prominent local companies.At this hotel you can enjoy:- All Day Dining- Free WiFi- Family rooms for 2 adults and 2 kids under 12Start the day in style with our Express Start™ Breakfast buffet, included in the room rate. Relax over a pint in the calm surrounds of our bright lounge bar and grab a cheeky after-hours pizza, available around the clock. Our comfortable Next Generation bedrooms all have 32" TVs with Freeview, and blackout blinds for a restful stay.